Japan's emperor since 1912 was Taisho, son of Emperor Meiji and father of the future emperor, Hirohito. Hirohito had been brought up in the traditions of Japanese militarism. As a boy he had most admired his tutor, Count Maresuke Nogi, an old soldier and the headmaster of a school for the sons of the aristocracy. Nogi taught Hirohito the traditional spirit of Bushido and the Way of the Samurai – Bushido being a feudal-military code of chivalry that valued honor above life. For Hirohito, Nogi embodied the spirit of Japanese religious faith, loyalty and bravery. Nogi's face and body bore traces of wounds from swords, arrows, bayonets, bullets and shrapnel. When Hirohito was twelve and his grandfather Emperor Meiji died, Nogi, seeing himself as a servant to Meiji, killed his wife and himself. Impressions of Nogi as representative of the Japanese spirit remained with Hirohito. But in 1921, when Prince Hirohito was twenty-one, his travel to Europe introduced him to a rival influence. Hirohito visited England as the guest of England's royal family. Late in his life, Hirohito would describe his visit to England as the happiest time of his life. In England he felt freedom from all the rigors and stiffness of court life in Japan. He was impressed by the relative informality of England's royal family. He felt that King George V was treating him like a son. He observed the mixture of casual attitude and affection that the English people had for their king – rather than the awe that the Japanese had toward their emperor. And he observed the freedom that the British press had in publishing matters related to the royal family – a freedom that went as far as slander. When Hirohito returned to Japan he tried to bring some of the casualness and informality back with him. He threw a party similar to a party that had been thrown by the Prince of Wales in Britain – which in Britain had caused a stir. At Hirohito's party was music, dancing and plenty of alcohol – the latter a gift to Hirohito when he was in Scotland. Hirohito remained stiff, but the others drank too much and expressed themselves with much gusto. The Elders around Hirohito were shocked, and in the following days they attacked Hirohito for behaving in a fashion unbecoming to the godly emperor he was supposed to be. 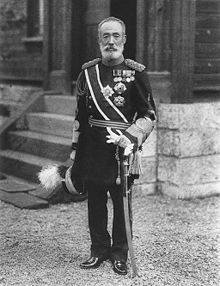 Prince Saionji, the most influential of the Genro, described Hirohito as filled with dangerous delusions of liberalism. The last thing Japan's Elders wanted on the throne was a human being instead of a god. In November 1921, during the Washington Naval Conference and one month after Hirohito returned from Europe, a young railway worker assassinated the prime minister, Hara, just after Hara had boarded a train en route to Kyoto. The assassin was convinced that Hara had "defiled the Constitution" by having taken over the job of Minister of Marine while the actual Minister of Marine was attending the Washington Naval Conference. An instigator of the assassination was Toyama Mitsuru, 66, former Samuria and daring militarist, now with a long white beard and spiritual leader of the "bully boys" of the patriotic Black Dragon Society. Toyama had considered Hara too liberal – although Hara had used police against strikers, had pushed to have strike leaders arrested for subversive activities, had suppressed Japan's Socialist League and had a professor dismissed for publishing an article on Kropotkin's anarchism. The assassin was tried and sentenced to a short time in jail, and Toyama was never tried. Then in March 1922 came another incident involving the Black Dragon Society. A member of that society blew himself up with a homemade bomb in front of the royal palace. He was protesting Hirohito having mixed with inferior foreign persons on terms of equality. That same month, March 1922, Japan's Communist Party came into being, and almost simultaneously a League for the prevention of Communism was formed in Japan. Its members dedicated their life to Communism's eradication. They worked for separation of the labor movement from socialism. They lectured businessmen on the dangers of liberal policies. Occasionally members used violence against Leftists, especially against anarchists. And as supporters of the emperor, they sponsored Japan's first "Patriotic Day." Japan, meanwhile, was climbing out of its recession – except for those industries such as ship building and coal, which had over-expanded during the war. Japan's troops were being withdrawn from Siberia, and despite the efforts of patriotic societies to instill a martial patriotism in the Japanese people, the military had not been winning enough hearts and minds among common Japanese, especially among pro-democracy supporters of labor or believers in letting good times roll. In Japan's culture wars, its military had been declining in prestige. No longer were bright students aspiring to join the army or navy. Military officers were now wearing civilian clothes when off duty.